While the rapid expansion of palm oil cultivation in Indonesia and Malaysia over the last decades has contributed to rural development, serious negative impacts have occurred. As a response, sustainability certification schemes such as the Roundtable on Sustainable Palm Oil (RSPO) have been established. Yet the connections of the oil palm industry with regard to biofuels are complex, and the capacity of certification to truly reduce social and environmental impacts remains questioned. The aim of the chapter is to assess how oil palm production affects the local environment and human well-being, so as to contribute to the ongoing debate regarding the potential role of palm oil biofuel to clean energy provision and local development. We first provide an in-depth literature review about the impacts of oil palm cultivation and palm oil biodiesel production/use for ecosystem services, biodiversity, and human well-being. We then draw on empirical data from RSPO stakeholders regarding their perceptions about the extent/severity of those impacts and the potential of the industry to mitigate them. Our study shows how palm oil biodiesel production/use impacts biodiversity and several ecosystem services in Malaysia and Indonesia, which in turn can compromise the well-being of the local communities that rely upon them. Findings suggest that, far from being homogeneous, RSPO’s stakeholders’ perceptions are very divergent, particularly regarding the industry’s impact on climate and biodiversity. Reconciling these different perceptions is the first step for coming up with mutually acceptable standards and will be the great bet for certification schemes in the future. Palm oil is an essential part of the diet of many people around the world. It is also a key raw material for the processed food, and pharmaceutical and cosmetics industry. According to the Food and Agricultural Organization of the United Nations (FAO), palm oil is the most widely produced vegetable oil accounting for 33% of the global vegetable oil production in 2014 (FAO 2017). At the same time, palm oil production has increased more than any other type of vegetable oil since 1961, recording a staggering 39-fold increase. The FAO projects that the production of oil crops will almost triple (from 100 million tons to 293 million tons) in 2050 with a large part of this increase being due to oil palm expansion. Globally, most of the palm oil production is located in Southeast Asia and particularly in Indonesia and Malaysia. The two countries accounted for 85.4% of global production in 2014 and for 86.0% of palm oil exports in 2013 (FAO 2017).1 In fact, the huge increase in palm oil production globally has been spearheaded by the oil palm expansion and yield increases in the two countries. Between 1961 and 2014, palm fruit yield increased by 27.7% in Indonesia and by 77.4% in Malaysia (FAO 2017). However, these yield increases are nowhere near to the expansion of the area under oil palm cultivation, a 106-fold expansion in Indonesia and a 108-fold expansion in Malaysia (Fig. 10.1). There is evidence to suggest that oil palm production mainly happened at the expense of forested land rather than land already under agriculture (Gibbs et al. 2010). According to Koh and Wilcove (2008), 55–59% of oil palm expansion in Malaysia and at least 56% in Indonesia occurred at the expense of primary forests. Estimates suggest that since 1990, 1 million ha and 1.7–3 million ha of forest were lost in Malaysia and Indonesia, respectively, due to oil palm (Fitzherbert et al. 2008; Koh and Wilcove 2008). There have been fears that the lack of careful planning in the ongoing expansion of oil palm in Indonesia might lead to significant additional deforestation (Koh and Ghazoul 2010). Smallholders play a significant role is the palm oil sector in Indonesia (Pricewaterhouse Coopers 2010; Gatto et al. 2015). Most smallholders have entered the palm oil sector through state-sponsored agreements between private companies and local communities (plasma schemes).2 There have been two main types of plasma schemes, the PIR Trans schemes (nucleus-community plantation), which target individual farmers, and the KKPA schemes, which target cooperative farmers. Lately there have other types of land-leasing agreements such as the kemitraan schemes and the plantation revitalization schemes (McCarthy et al. 2012a). Despite some differences, these schemes stipulate that the palm fruit produced in the land “leased” by local communities has to be sold to the private company with which the local community has made the arrangement (McCarthy 2010; McCarthy et al. 2012a). In return, the company provides all necessary inputs and knowledge for oil palm cultivation. Such schemes determine to a large extent the productivity targets, and as an extension the production practices employed (e.g., fertilizer use). As a result these plasma agreements can be viewed as a major determinant of the local environmental and socioeconomics impacts of oil palm in Indonesia. Currently palm oil is mostly absorbed by the food industry, a trend that is likely to continue in the short-to-medium term.3 However in the late 2000s, palm oil was considered as a particularly promising feedstock for biodiesel production within the two countries and abroad. For different reasons, Malaysia and Indonesia took steps to promote the use of biofuels, mainly palm oil biodiesel, (Table 10.1). In 2010 Malaysia had already mandated the use of B5 (diesel containing 5% biodiesel), but Indonesia had not yet enacted mandatory biofuel blending (REN21 2010). Currently both countries have enacted relatively ambitious biodiesel mandates: B10 in Malaysia and B20 in Indonesia (REN21 2016). At the international level, the 2009 European Union Directive on Renewable Energy (EU-RED) required that by 2020 10% of all transport fuel used within the EU should come from renewable sources (EU 2009). At that moment the EU was the largest producer and consumer of biodiesel (IEA 2011), so there were expectations of large increases of palm oil imports from Indonesia and Malaysia for conversion into biodiesel (Obidzinski et al. 2012). TE (2016) estimates that 45% of the palm oil used in the EU is used for biodiesel and 16% for electricity/heating (up from 8% and 14% in 2010). An immediate result of the above is that the palm oil industry became closely linked to energy markets, at least conceptually. This perceived interest in palm oil-based biofuels in the late 2000s seems to have led to a sharp increase in the overall volume of imported palm oil in the EU (FEDIOL 2016). At the same time it contributed to the immense pressure from the environmental community for the adoption of more sustainable practices for palm oil production. This was part of the series of criticisms that the palm oil sector started facing since the late 1990s regarding its environmental and social performance (Schouten and Glasbergen 2011). Common practices in palm oil cultivation such as extensive monocultures, land clearing through fire, and pollution due to high fertilizer/pesticide use and palm oil mill effluent (POME) were identified as particularly damaging to the environment and biodiversity (Sect. 10.3). Such concerns catalyzed the establishment of the Roundtable on Sustainable Palm Oil (RSPO) in 2004, a multi-stakeholder alliance promoting the sustainable production and consumption of palm oil. RSPO brings together important actors across the palm oil chain, such as large producers, smallholders, processors, traders, nongovernmental organizations (NGOs), and certifiers among others. Despite the initially slow take-up of the RSPO standard, the RSPO-certified growers accounted for approximately 28% of global palm oil production in 2012, with 42% of their product being already certified (RSPO 2012). However, the broader legitimacy of the RSPO has been questioned (Schouten and Glasbergen 2011; Partzsch 2009; Silva-Castaneda 2012; von Geibler 2013; Nikoloyuk et al. 2010). This is possibly because RSPO stakeholders have joined (and operate within) the alliance having radically different agendas and motivations (Schouten and Glasbergen 2011). Such divergent approaches within, and beyond RSPO, throw into doubt its ability to effectively promote the sustainable production and consumption of palm oil (Partzsch 2009). In any case this growing connection between palm oil and biofuels in the late 2000s sparked some visible changes in the palm oil production chain as even companies that were not involved in biofuels (having produced palm oil for more than 100 years) were under increasing pressure to adapt their business practices to satisfy the environmental concerns of their clients. Considering the above, this chapter elicits some of the concerns that key stakeholders involved in the RSPO process articulated during the early 2010s about the possible impacts of biofuel-driven palm oil expansion on the environment and human well-being. 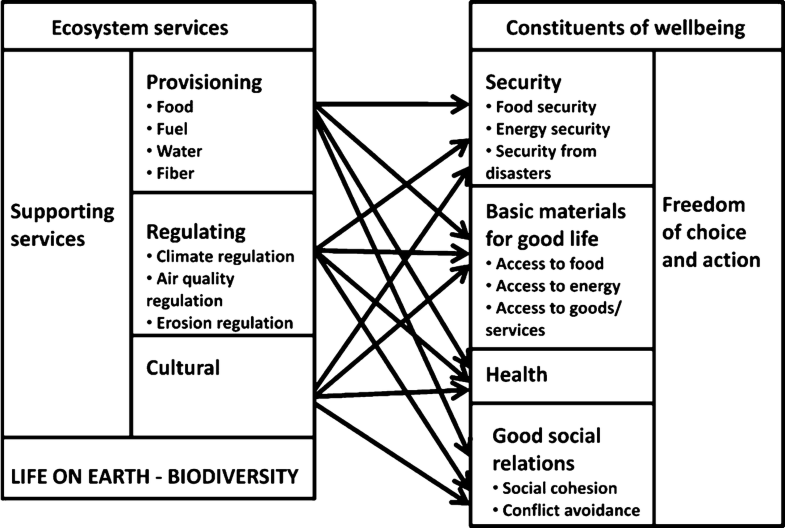 We use an ecosystem services perspective as a means of synthesizing the literature and highlighting the interlinkages between biofuel-driven ecosystem change and human well-being (MA 2005a, b). Section 10.2 provides a brief literature review of the key impact of oil palm cultivation and palm oil biofuel production and use on ecosystem services and human well-being. Section 10.3 outlines the methodological approach used to elicit stakeholder perceptions. Section 10.4 compares the perceptions of different stakeholder groups involved in the RSPO process on how the palm oil industry affects local ecosystem services and human well-being (Sect. 10.4), while Sect. 10.5 outlines the main lessons learnt during this stakeholder engagement process. 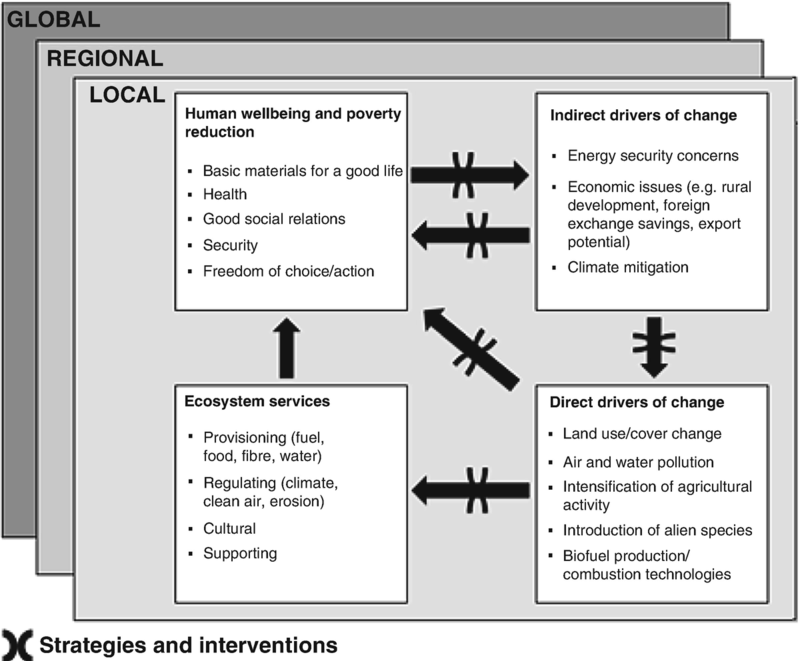 The ecosystem services approach explicitly links ecosystem change to human well-being (MA 2005a, b). These are two key components of the biofuel debate that are evoked by proponents and critics of biofuels alike (Gasparatos et al. 2011). Studies have adapted the ecosystem services approach to synthesize knowledge about different biofuel value chains (e.g., Gasparatos et al. 2011) as well as assess specific impacts (e.g., Gissi et al. 2016; Romeu-Dalmau et al. 2017; Meyer et al. 2015). Sections 10.2.2 and 10.2.3 collect and discuss the key environmental and socioeconomic impacts associated with palm oil biodiesel production/use in Malaysia and Indonesia employing the conceptual framework popularized by the Millennium Ecosystem Assessment (MA 2005a, b) as it has been adapted for biofuels by Gasparatos et al. (2011). Recent studies have shown that biofuels can be major agents of ecosystem change due to land use and cover change (LUCC), pollution, climate change, introduction of alien invasive species, and overexploitation (Gasparatos et al. 2017). Following the MA vocabulary, we collectively refer to these factors as the direct drivers of biofuel-induced ecosystem change. Consequently the drivers of biofuel expansion itself (i.e., energy security, climate change mitigation, rural development) mentioned in Table 10.1 can be seen as the indirect drivers of biofuel-induced ecosystem change (Fig. 10.2). 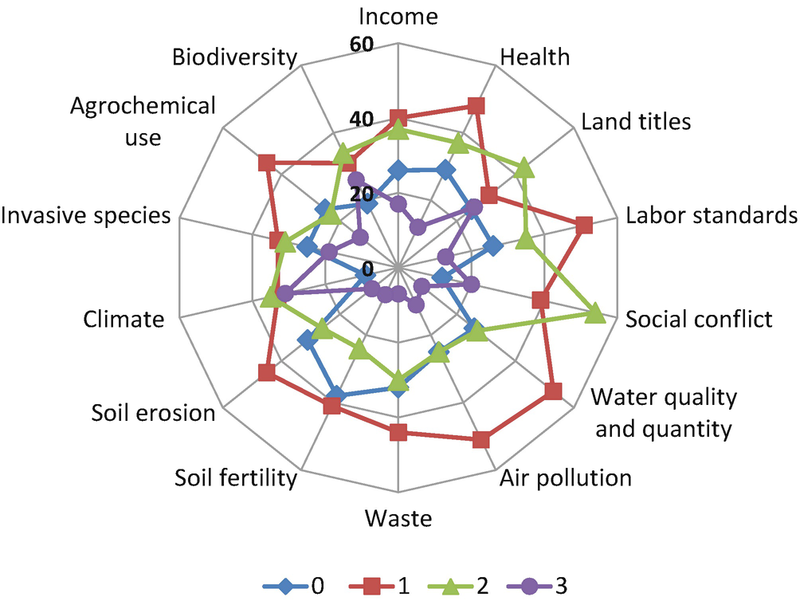 It should be noted that in the case of ecosystem services, the way the evidence is reported in the academic literature coincides to an extent with the typology of ecosystem services used in the MA conceptual framework. However with the exception of “health,” the human well-being impacts of biofuels are not reported following the constituents of human well-being outlined in the MA framework (Gasparatos et al. 2011). Furthermore in the case of palm oil biodiesel, the constituents of human well-being seem to be interlinked. 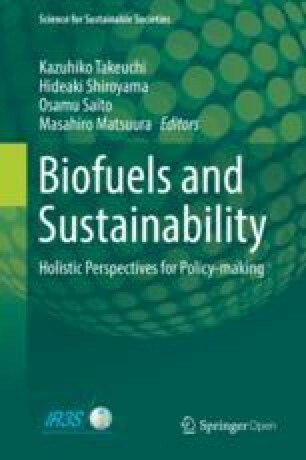 In order to overcome these challenges, we identify the main impacts of biofuels on human well-being as reported in the academic literature, i.e., rural development, energy security/access to energy, food security/access to food, and health and land tenure. We then proceed in each of these sections to discuss which of the MA constituents of human well-being are directly4 impacted and through which mechanisms. Figure 10.3 below depicts the linkages between ecosystem services and human well-being in the context of biofuel production. For example, biofuel expansion may increase access to fuel but also reduce access to food, hence affecting both security and basic materials supporting livelihoods. Lastly, strategies and interventions such as land use planning can enhance the ecosystem and social benefits resulting from the linkages between the four squares of Fig. 10.1. Examples of such response measures are given in Sect. 10.6. Oil palm fruits are the main ecosystem service provided by areas converted for oil palm production (Dislich et al. 2017). The palm oil derived from processing these fruits can be used for the production of biodiesel through trans-esterification (Mekhilef et al. 2011). Oil palm agriculture can be highly productive, but at the same time it depends on the agricultural practices adopted (Sheil et al. 2009; Woittiez et al. 2017). Several studies have confirmed the large biodiesel potential from oil palm in Indonesia and Malaysia (e.g., Mukherjee and Sovacool 2014), but there is a need for more rational allocation of land resources to meet multiple objectives related to food, bioenergy, and biodiversity conservation (Harahap et al. 2017). As mentioned in Sect. 10.1, palm oil is the most widely produced vegetable oil globally, being a major component of the food industry. Biofuel feedstock production can sometimes entail the direct diversion of crops from food-related uses, potentially contributing to, among others, reduced local food availability and increases in food prices (Gasparatos et al. 2011; Schoneveld 2010) (Sect. 10.2.4.3). Mekhilef et al. (2011) report that close to 40% of Malaysian palm oil had been allocated for fuel production, putting pressure on remaining amount for vegetable oil demand. The direct and indirect LUCC effects of oil palm expansion may affect local food production (particularly rice cultivation) either due to the direct loss of arable land or reduced water availability for agriculture (e.g., Oosterveer et al. 2014). Furthermore, as a key driver of deforestation (Sect. 10.2.2.4 and 10.2.3), oil palm agriculture can affect the provision of other ecosystem services from grassland and woodland ecosystems such as timber, rubber, wild food, and non-timber forest products (NTFP) among others (Dislich et al. 2017). Studies have identified that these trade-offs can be particularly significant in communities that highly depend on forest for their livelihoods (Sheil et al. 2009). However it is interesting to note that various parts of oil palm trees and fruits have been used for the development of different types of medicine (Dislich et al. 2017). Palm oil biodiesel production can affect freshwater ecosystem services through multiple mechanisms (De Fraiture and Berndes 2009; Dislich et al. 2017). When it comes to water consumption, water footprint analysis has shown that palm oil biodiesel from Malaysia and Indonesia has relatively lower water footprint (expressed in m3 of water consumed per GJ of energy produced) than most other first-generation biofuel practices (Gerbens-Leenes et al. 2009a, 2009b; Mellko 2008; Van Lienden et al. 2010). However, the actual effects of oil palm agriculture on freshwater ecosystem services can be much more complicated as the conversion of forested land to oil palm monocultures can affect a series of functions related to hydrological cycles (Dislich et al. 2017). A recent meta-analysis of the literature suggests mostly negative effects due to decreases in a series of functions such as water storage, infiltration rate, regularity of supply, regulation of peak flows, water quality, and flood and drought prevention (Dislich et al. 2017). When it comes to water quality, oil palm plantations are very fertilizer intensive in both countries (FAO 2004; FIAM 2009; FAO 2005). Fertilizer and pesticide residues can enter water bodies and potentially disrupt ecosystem functioning and negatively affect human health (refer to Sect. 10.2.4). The palm oil industry has also been identified as a major source of water pollution in Malaysia (Muyibi et al. 2008). Palm oil mill effluent (POME) is characterized by high levels of BOD5 with approximately 2.5–3 tons of POME being produced for each ton of palm oil (Wu et al. 2010). However it has been suggested that POME can be used for oil palm but the environmental co-benefits of such practices are debatable. Biofuels have been identified as potential climate mitigation options (e.g., IPCC 2007). Even though biofuel production/use can emit significant amounts of GHGs during their whole life cycle (Hess et al. 2009), several LCAs have shown that some biofuel practices can emit less GHG than fossil fuels during their whole life cycle. Palm oil biodiesel can provide significant carbon savings (up to 80%) when compared to conventional fossil fuels (Menichetti and Otto 2009). Smeets et al. (2008) calculate robust GHG reduction potential of up to 75%. RFA (2008) reports a 46% GHG savings for palm oil biodiesel in Malaysia. However most new oil palm plantations have been established on previously forested areas and often on former peatland forests (Carlson et al. 2012). Such LUCC effects can result in high carbon debts (Carlson et al. 2012; Koh et al. 2011; Moore et al. 2013; Ramdani and Hino 2013; van Straaten et al. 2015; Dislich et al. 2017) that might take several decades or centuries to repay. Danielsen et al. (2009) calculated that depending on the forest clearing method used, it would take 75–93 years for an oil palm plantation to compensate the carbon lost during the conversion of the initial forest, 600 years if that happens on peatland, and approximately 10 years if that happens on grassland. Fargione et al. (2008) report that the time to repay the biodiesel carbon debt would be 86 years if palm oil is established on forested land and 423 years if that forest is located on peatland. RFA (2008) calculates carbon payback time of 0–11 years for biodiesel from oil palm grown on grassland and 18–38 years on forested land. Palm trees, like all other plants, emit volatile organic compounds (VOCs) and isoprene in particular. Hewitt et al. (2009) and Fowler et al. (2011) have shown that indeed VOC and nitrogen oxides (NOx) emissions, which are tropospheric ozone precursors (O3), are greater from oil palm plantations than from primary rainforest. Sometimes the land that is used for oil palm production is cleared through the use of fire (e.g., Van der Werf et al. 2008). Biomass burning has been identified as major sources of atmospheric pollution and GHG emissions, affecting significantly atmospheric chemistry and biogeochemical cycles among other impacts (Crutzen and Andreae 1990). Communities adjacent to oil palm plantations often report declining air quality due to activities within the plantations (Obidzinski et al. 2012). Mature oil palm plantations in Malaysia have a soil erosion rate of approximately 7.7–14 tons/ha/year with erosion rates being even larger during the early years of the plantation when a complete palm canopy has not yet been established (Stromberg et al. 2010; Lee et al. 2012). In order of decreasing soil erosion hazard,6 de Vries et al. (2010) ranked the most commonly used feedstocks as follows: cassava, soybean, sugarcane, sorghum, corn, sugar beet, winter wheat, oil palm, and winter rapeseed. However when compared to natural ecosystems, oil palm plantations have much lower erosion control potential (Dislich et al. 2017; Buschman et al. 2012). In some cases eroded soil can enter water bodies further deteriorating local water quality (Obidzinski et al. 2012) or can result in the loss of soil organic carbon further contributing to the loss of climate mitigation services (Guillaume et al. 2015). For local communities and indigenous people, cultural services frequently form an important element of their culture and can be threatened by land use change, e.g., through habitat destruction and the displacement of traditional crops (MA 2005a). It has been suggested that biofuel-induced deforestation can affect indigenous people disproportionately. For example, almost half of Indonesia’s population depends on ecosystem goods and services from forests with approximately 40 million of these people being indigenous and having been already affected (Tauli-Corpuz and Tamang 2007). Cultural ecosystem services are a particularly understudied topic within the literature related to palm oil impacts. 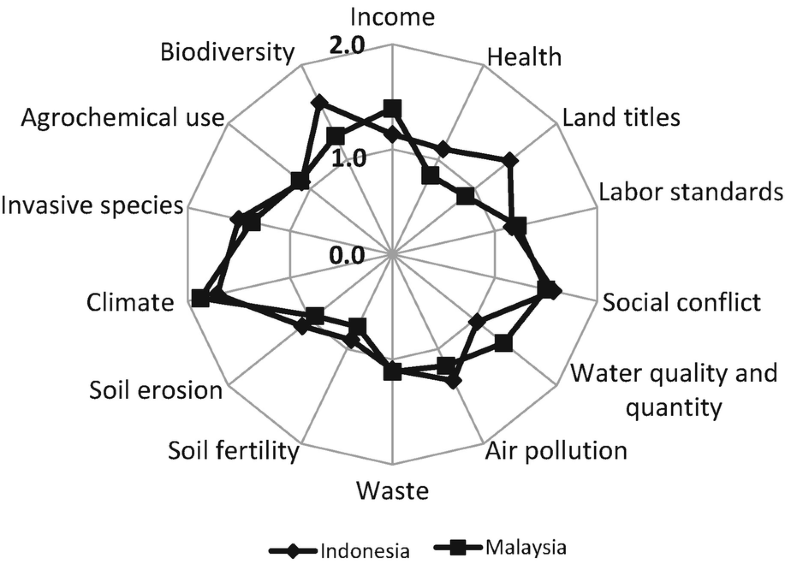 While these are some cultural benefits related to spiritual values in areas that oil palm grows naturally, the evidence suggests overwhelmingly negative impacts on cultural ecosystem services in areas that oil palm is grown intensively and has replaced forest (Dislich et al. 2017). Biofuel production (particularly feedstock cultivation) can have multiple negative impacts to biodiversity (Gasparatos et al. 2017). Biodiversity is not an ecosystem service per se but “…the foundation of ecosystem services to which human well-being is intimately linked” (MA 2005: 18). According to the MA, there are six main direct drivers associated with biodiversity decline: habitat destruction, overexploitation, invasive species, disease, pollution, and climate change (MA 2005a). Palm oil biodiesel production/use can be strongly linked to at least three of these drivers, i.e., habitat destruction, pollution, and climate change with habitat destruction being considered as the most important. Overall several systematic reviews have highlighted the overall negative biodiversity outcomes of the conversion of natural habitats to oil palm plantations (Dislich et al. 2017; Savilaakso et al. 2014). Oil palm cultivation in large-scale monocultures is by definition inhospitable to biodiversity. Oil palm plantations contain much fewer species than primary forests (e.g., Fitzherbert et al. 2008; Danielsen et al. 2009; Foster et al. 2011). Additionally several studies have found that the majority of the forest species was lost and replaced by smaller numbers of non-forest species with the subsequent animal communities being dominated by a few generalist species of low conservation value (Danielsen et al. 2009). Not surprisingly, plant diversity within oil palm plantations was impoverished compared to forests due to regular maintenance and replanting (every 25–30 years) of oil palm fields (Fitzherbert et al. 2008; Danielsen et al. 2009). Indonesia and Malaysia currently have a large and highly competitive palm oil production sectors that are very important to their respective national economies. The oil palm sector can provide substantial employment and income opportunities (Rist et al. 2010; Cahyadi and Waibel 2013). Winrock (2009) estimated that up to 57% of Riau’s population, and between 10–50% in 11 other Indonesian regions, were supported one way or another by the oil palm industry (including employees and family dependants in downstream processing and associated services). Local communities in Indonesia often perceive oil palm cultivation as a promising livelihood activity (Rist et al. 2010). 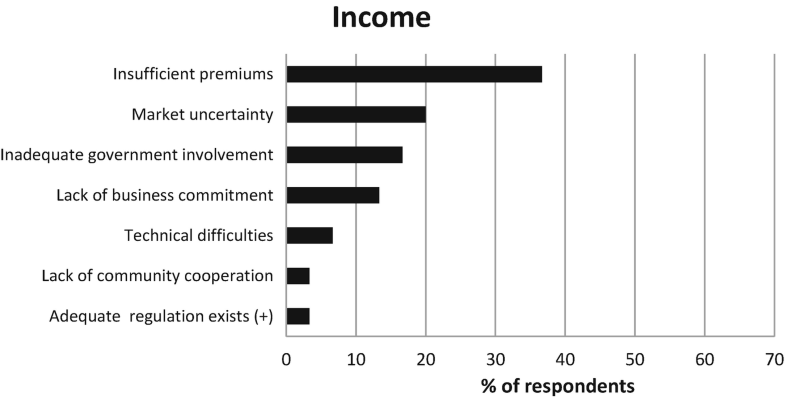 Oil palm production can have higher income returns to land and labor for smallholders, but the overall livelihood benefits can depend significantly within (and across) communities (Rist et al. 2010; McCarthy 2010) (see Box 10.1). For example, while income from oil palm production contributes significantly to the livelihoods of independent smallholder households (e.g., Lee et al. 2014; Budidarsono et al. 2012), it can vary depending on the agricultural practices adopted (Lee et al. 2014). In some cases the received income can be severely reduced after paying the initial loans that allow them to be involved in oil palm agriculture, but the repayment period can depend on multiple circumstances (Feintrenie et al. 2010). According to legislation, wages for permanent plantation workers should be at least equal to the provincial minimum labor payments in Indonesia. While locals can complement their farm income through temporary work in plantations (Tata et al. 2010; McCarthy 2010), in some regions, plantation jobs are often monopolized by transmigrants (Obidzinski et al. 2012, 2014). It is also worth mentioning that working in oil palm plantations is often a strenuous activity, with, sometimes, low labor standards and substantial gender disparities (Li 2015). Despite its potential to improve rural development, the oil palm sector operates in isolation in many Indonesian provinces and has limited economic multipliers (Obidzinski et al. 2014). Often this happens because employment benefits do not always reach the local communities, as permanent contract workers for agricultural labor and management in large plantations are usually transimmigrants (transmigrants) (Tata et al. 2010; Obidzinski et al. 2012; McCarthy 2010; Obidzinski et al. 2014). It should be also noted that shifting to biofuel feedstock production can be a risky endeavor particularly for independent smallholders (Feintrenie et al. 2010). High market and production chain uncertainty as well as difficulty in complying with certain types of production standards can expose smallholders to the financial risk of not getting adequate returns on their investment or even being excluded altogether by the oil palm value chains (Jelsma et al. 2017; Cahyadi 2013). Price volatility in food commodities has been very prevalent since the 2000s, while adding the generally high volatile nature of energy markets in the equation, it can make decision regarding a shift toward biofuel feedstock production more difficult to handle particularly for smallholders (Woods 2006; Robles et al. 2009; DTE 2005). Mulyoutami et al. (2010) studied oil palm adoption in Tripa (Aceh, Indonesia) as part of the 2004 tsunami rebuilding programs. They tracked government incentives, particularly smallholders, to switch from their previous economic activities to cultivate oil palm. They reported that smallholder plots in the Nagan Raya district had 120–150 oil palms per hectare and generated a gross production value of IDR 600,000–1,500,000 (approximately USD 67–168) per month per hectare. In 2010, the price of a fresh fruit bunch ranged between IDR 700,000 and 1,050,000 (approximately USD 80–110) per ton. A local survey in the Ladang Baru area showed that income for oil palm smallholders was higher than income from other local economic activities (e.g., 160,000–5,500,000 IDR/month compared with IDR 120,000–2,800,000 for oil palm plantation workers and IDR 115,000–750,000 for fishing). As mentioned above, wages for permanent plantation workers are regulated and should be at least the provincial minimum labor payments. In the case of Aceh province, this was IDR 1,000,000 per person per month in 2008. While such laborers tend to be immigrants, locals often take on sporadic day work to complement their farm income, earning a wage of IDR 25,000–40,000 (±USD 2.80–4.45) per day (Mulyoutami et al. 2010). Several life cycle analyses (LCAs) have concluded that palm oil biodiesel production in Indonesia and Malaysia are net-energy providers, resulting in fossil energy savings of up to 80% (Zah, et al. 2008; Harsono et al. 2014; de Vries et al. 2010). A comparative LCA study ranked different biodiesel production chains according to their decreasing energy consumption, as follows: soybean (Argentina), soybean (Brazil), rapeseed (EU), rapeseed (Switzerland), palm oil (Malaysia), and soybeans (the USA) (Panichelli et al. 2009). Such findings suggest that palm oil biodiesel can be a feasible energy options in Malaysia and Indonesia, possibly enhancing national energy security. 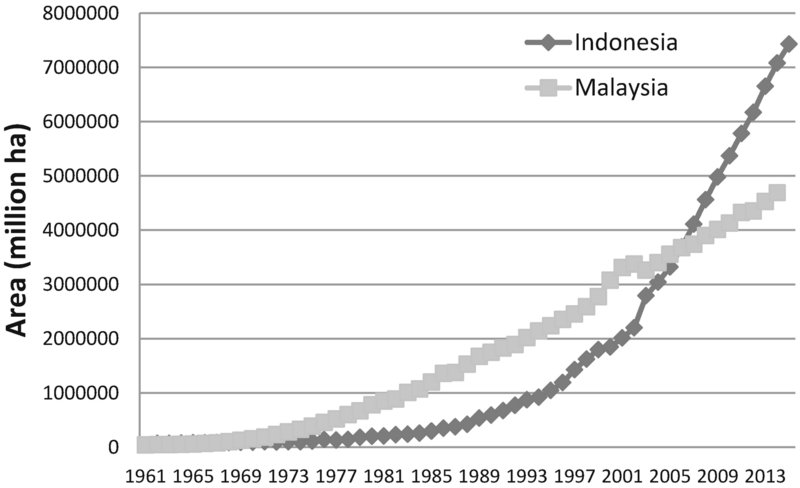 In fact energy security has been identified as a major driver of biofuel production in Indonesia and Malaysia (Zhou and Thomson 2009). In spite of its significant domestic fossil fuel endowments, Indonesia is a net importer of crude oil and expects a strong increase in population. For these reasons there a strong need for alternative energy sources. The Presidential Decree No. 5 (2006) stated that biofuel would fulfill 5% of the total energy consumption by 2025 (APEC 2010). The Ministry of Energy and Mineral Resources stated that 520,000 tons of biodiesel were produced in 2007 in eight biodiesel plants, with another 15–17 planned for 2011, producing an additional 2 million kL of biodiesel (Zhou and Thomson 2009). The biofuel mixes B5 (Biosolar) and E5 (Biopertamax) have been available through the state-owned oil firm Pertamina. In January 2008, the rising international price of palm oil made Pertamina reduced the percentage of biofuels in its Biosolar and Biopertamax fuels from 5% to 2.5% (APEC 2010). Currently both countries have enacted relatively ambitious biodiesel mandates: B10 in Malaysia and B20 in Indonesia (REN21 2016). However the programs in both countries have been criticized about their effectiveness in boosting national energy security (Putrasari et al. 2016; Rahyla et al. 2017). Oil palm waste such as empty fruit bunches can also be used as a feedstock for electricity generation and ethanol and/or biogas production having ripple positive effects on national and local energy security (e.g., Begum et al. 2013; Jinn et al. 2015). The Indonesian government committed to promote local energy security through the energy self-sufficient villages (ESSV) program. Bioenergy from oil palm was one of the energy sources considered, but to our best knowledge the program failed to produce good results, despite its vision to create the capability in thousands of villages to meet their own energy demand from locally available renewable resources such as biofuels, hydropower, and wind energy (IGES 2010). 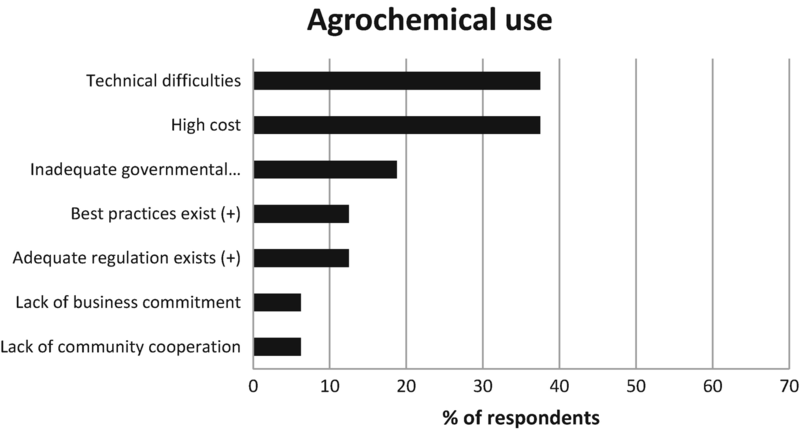 Biofuels can affect food security through multiple mechanisms related to the four pillars of food security proposed by the Food and Agricultural Organization (i.e., availability, access, utilization, and stability) (Wiggins et al. 2015). For example in Sect. 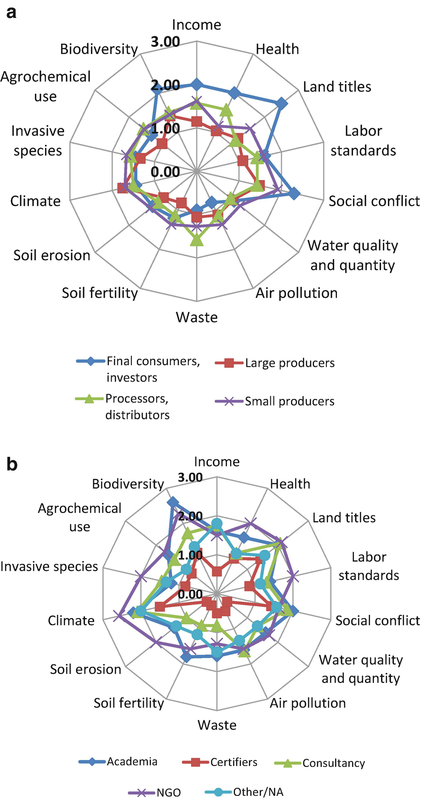 10.2.2.2, it was shown how feedstock production can divert food crop production, essentially reducing food availability through a trade-off between two provisioning ecosystem services (i.e., feedstock vs. food) (see also Sayer et al. 2012). At the same time, the income received from oil palm production and employment in plantations can be used to buy food, increasing thus household access to food and improving their nutrition (Euler et al. 2017). Furthermore smallholders can invest this income to buy agricultural inputs or have better access to inputs due to credit access as a result of their outgrower contracts functioning as collateral (Cramb and Sujang 2012; Cramb and McCarthy 2016). Environmental change may also affect local food production. For example, in areas of the Tripa province, the expansion of oil palm plantations led to water shortages in swamps, prohibiting the development of rice paddies (Mulyoutami et al. 2010). Food security is a multidimensional concept, so effects such as those discussed above are not only difficult to be delineated at the local level but must be understood with respect to the national and international context. In Indonesia, the increased export demand for palm oil (Sect. 10.1) has possibly increased risks to palm oil shortages for Indonesian consumers. While palm oil prices can vary within year(s), they increased considerably in two very discrete spikes in the late 2007 (from USD 540/ton in early 2007 to USD 1440/ton in mid-2008) and mid-2010. This was possibly driven by demand for biofuel feedstock that also drove up the prices for sugar, grains, and vegetable oils (including palm oil), hence increasing households’ living expenditures (OECD 2008) (Sect. 10.1). Such concerns have in several occasions prompted the Indonesia government to impose export taxes on palm oil, as a way to secure sufficient supply for domestic users. For example, in January 2011, the Indonesian Trade Ministry announced an increase of the tax to 25 percent to a large extent to avoid escalating food prices (Jakarta Post 2011; Bouët and Laborde Debucquet 2016). While subsistence farmers may not be directly affected by changes in international commodity prices, poor people in food-deficit developing nations are considered as particularly vulnerable considering that they use a very large fraction of their income on food (e.g., Runge and Senauer 2008). Gasparatos et al. (2011) report several cases around the world where individual and public health have been compromised due to biofuel expansion. Health threats can be due to labor conditions in plantations (e.g., due to strenuous work), agricultural practices employed (e.g., use of agrochemicals, land clearing through fire), and malnutrition as a result of rising food prices. Several publications have reviewed the health hazards of working and living in the vicinity of oil palm plantations (e.g., Ng et al. 2014; UNICEF 2016). Regarding malnutrition, while there is evidence to suggest lower malnutrition levels in villages involved in oil palm activities (e.g., Budidarsono et al. 2012; Euler et al. 2017), there have been recorded instances in Indonesia of mothers in poor families lowering their food intake in order to feed their children when food prices rose (partly due to biofuels), (Actionaid 2010). Furthermore the air pollution health effects that have resulted from forest fires, to an extent for land clearing for oil palm expansion, in Indonesia, have been thoroughly documented in the academic literature (Frankenberg et al. 2005). Land tenure conflicts related to oil palm expansion have been a much-debated topic (e.g., Nesadurai 2013; Dhiaulhaq et al. 2014). 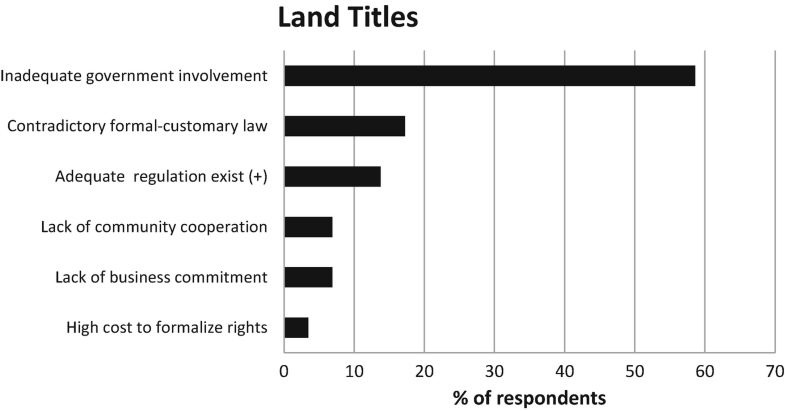 In Indonesia, land conflict related to oil palm plantations is a much-debated topic, with some authors reporting the concentration of land to powerful actors and the loss of land rights through coercion/lack of information (Cotula et al. 2008). There have also been allegations that logging companies and large plantations owners have displaced indigenous people when establishing new oil palm plantations (USAID 2009; Winrock 2009). In some cases oil palm plantations have been established without recognition of traditional land borders, rights, and interests (WWF 2006; Tata et al. 2010). Feintrenie et al. (2010) have also documented instances of social conflicts emerging in oil palm landscapes between local communities, transmigrants, and oil palm companies. Finally, the oil palm boom may have spurred speculative land acquisitions or even land grabs (McCarthy et al. 2012b) with the transfer of tenure from local communities to large companies occasionally affecting the land tenure rights of women (White and White 2012; Oosterveer et al. 2014). Section 10.2 has shown how palm oil biodiesel production/use can affect the ecosystem services upon which local populations depend for their well-being. Whether these impacts are positive or negative7 does not only depend on the environmental and socioeconomic context of production/use but also on the technological processes and the policy instruments adopted during biodiesel production and trade (Gasparatos et al. 2011). As a result it is often very difficult to provide clear-cut answers regarding palm oil’s impact on ecosystem services and human well-being and as an extension on palm oil biodiesel’s sustainability. There is a consensus that when assessing the impact of human activity on ecosystem services, it is important to integrate different types of knowledge in order to increase the effectiveness and transparency of decision-making (MA 2005b; TEEB 2010; Díaz et al. 2015). 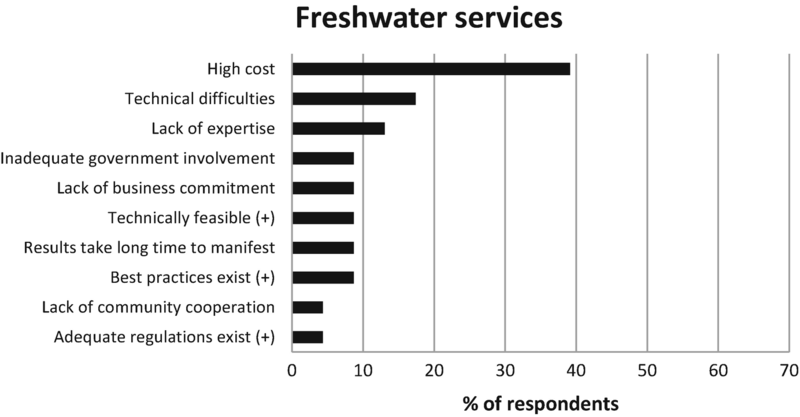 In fact the values and priorities of relevant stakeholder groups need to be captured and understood in order to better inform ecosystem services management. 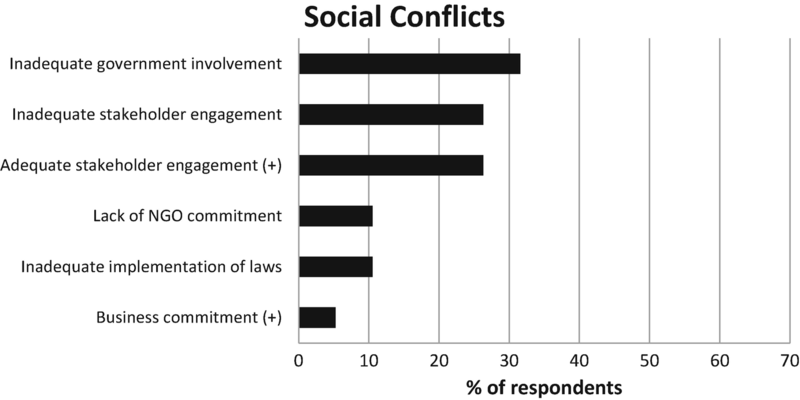 As a result, a wide range of participatory mechanisms has been developed both to enhance stakeholder participation and facilitate social learning at different stages of the decision-making process (e.g., Reed 2008; Stringer et al. 2006). Several studies have mapped the sociopsychological dynamics for selected communities. For example, Raymond et al. 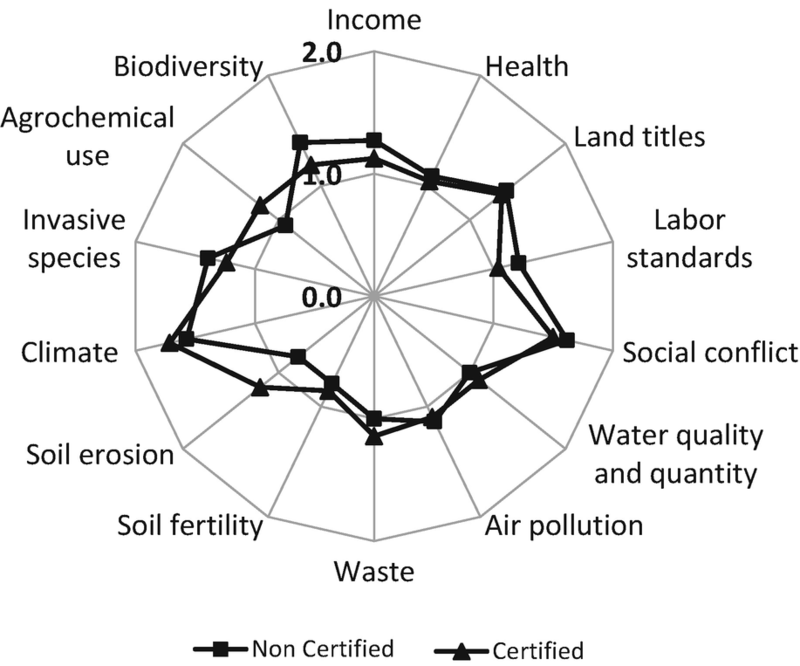 (2009) have proposed a “community values mapping method” for identifying community values and threats to natural capital assets and ecosystem services. Cuppen et al. (2010) have explored how stakeholder dialogue about different energy options in the Netherlands can bring diverse perspectives into the debate as a necessary precondition for understanding the complex bioenergy issues within the country. We focused on informants affiliated in different capacities within the RSPO process, as this is a multi-stakeholder alliance that aims to promote the sustainability of palm oil. It is possibly the only large-scale and comprehensive effort to bring together the different stakeholders within the palm oil supply chain. In this respect the RSPO process has the capacity to influence the global debate on palm oil sustainability. To our best knowledge, there are no studies that empirically capture the perceptions of different RSPO stakeholders as they relate to the impacts of palm oil on ecosystem services and human well-being. Capturing and understanding the multiplicity of these perceptions is particularly relevant for the RSPO, as these differences can complicate the attainment of consensus (Schouten and Glasbergen 2011; Partzsch 2009; Silva-Castaneda 2012; von Geibler 2013). We undertook semi-structured interviews with managers and executives involved in different capacities in the palm oil sector (e.g., oil palm plantations, trading companies, CPO plants, agricultural production in-house researchers, and refiners). These interviews were conducted during several field visits in Sumatra (2–5 July 2010), Singapore, and Johor (Malaysia) (30/June/2010 and 05/July/2010). In addition, we carried out informal discussions with workers and local residents during the field visits in these areas. Interviewees were asked questions regarding the perceived changes due to the adoption of certification standards by the palm oil industry and their impacts on ecosystem services, human well-being, and biodiversity. The structured questionnaire consisted of 15 questions, 14 of which were fixed-range questions that aimed to capture the stakeholders’ perception about the impact of the oil palm industry on ecosystem services, biodiversity, and human well-being. The remaining question aimed to identify whether the respondents were involved/interested in palm oil biodiesel production. The questionnaire also captured the stakeholders’ perceptions about the main reasons behind the current impacts of palm oil production. It identified the main barriers, opportunities, and appropriate ways to reduce the negative impacts. The respondents elaborated their quantitative answers in designated boxes next to each of the 14 impact questions. The wording used as the caption in these boxes was: “Why? Please explain briefly (for example, high/low cost, political constraints/opportunities, technical feasibility/difficulty, etc). Five hundred hardcopies of the questionnaire (450 in English and 50 translated in Bahasa Indonesia) were distributed during the plenary sessions of RSPO-RT8 (Jakarta, Indonesia), which were sufficient to cover all potential attendees during the first day plenary.8 A brief announcement was made by the RSPO-RT8 organization committee to inform the participants about the survey and to request their collaboration in filling it. Build the certification standard upon their existing ISO 14001 standard (for those companies that were already ISO 14001 certified). Create a sustainability team (i.e., sustainability managers, officers, directors). Introduce good environmental practices (such as recycling and use of byproducts), which saved costs in some cases. Collect data and document properly their environmental, labor, and social practices. Improve labor standards (e.g., safety9) and the social aspects of their business practices (e.g., informality in the labor force). Include biodiversity concerns in the management of their plantations. For example, during the interviews, a large producer mentioned that it is their standard business practice to consult their clients once a year about the modifications that need to be done in their current operations. As early as the early 2000s, their clients indicated a preference for adopting the ISO 14001 standard. Subsequently the company took part in the early RSPO discussions (2004) and was one of the first to obtain RSPO certification (2008) mainly due to concerns over deforestation that were articulated by their European customers. By that time the company was already ISO14001 certified and had adopted good social practices. As a result it was relatively straightforward for them to comply with the RSPO standard. It was also expressed that the RSPO certification process can be achieved more easily for large companies that are involved in several stages of the palm oil value chain (i.e., production, shipping, refining). Some of the good environmental practices adopted by the producers during the RSPO certification process can have a ripple effect on ecosystem services and biodiversity conservation. One such example is the conservation of riparian forests. According to Malaysian legislation, riparian forests should be protected accordingly, but that is rarely the case. However, the RSPO standards require the conservation of riparian forests, which are essentially buffer zones between streams and human dominated landscapes. Such forests can host several animal species and provide ecosystem services such as water purification and flood control (MA 2005a). A second good environmental practice promoted by the RSPO is the prohibition of planting oil palm trees in steep terrains (25 degrees or more). Forests in steep terrains could provide a series of ecosystem services including erosion control (MA 2005a). Finally companies that aspire for RSPO certification are required to use only certain low-toxicity RSPO-approved agrochemicals. At the same time, the RSPO is quite friendly toward the incorporation of more sustainable forms of pest management.10 Shift toward less hazardous forms of pest management can offer several benefits given the generally negative impact of agrochemicals on ecosystem services (e.g., on freshwater services), human well-being (e.g., health), and biodiversity (refer to Sect. 10.2). It should be mentioned that there are several occasions where the RSPO certification process has encountered obstacles by palm oil-producing companies. Our interviews suggested that it is not uncommon for site managers to be apprehensive of the RSPO certification scheme fearing potential productivity decreases. Furthermore companies need to invest resources in order to comply with the RSPO standard, which increases the cost of palm oil production (refer to Sect. 10.5). Interviewees also noted that the environmental (and indirectly the social) concerns addressed by the RSPO system or any similar certification scheme is not the only or most efficient way to promote the sustainability of the oil palm sector. Researchers from the development center of an interviewed company pointed out that new technologies in plant breeding are the “most promising instrument to make sustainable palm oil a reality.” According to the interviewee, the current productivity of palm oil plants has not reached the maximum potential, and hybridization technology will most probably bring astonishing increases in yields (up to sevenfold) in the coming years. This will eliminate the need for expansion into ecosystems rich in ecosystem services and biodiversity and in turn will allow smallholders to make a living within current land cultivation areas. A total of 139 questionnaires were returned with the response rate estimated at 25.3% based on the average number of attendees per plenary session (550 persons according to in situ observations). The response rates for each individual question varied across the 14 fixed-range questions, with questions in the front page of the questionnaire being answered more frequently than those on the back side. Quantitative responses to all 14 questions were included in 86 questionnaires, while the response rate to the question regarding the involvement/interest of the respondent in palm oil biodiesel was markedly lower. In total 127 questionnaires were used for the quantitative analysis. Most of these respondents were representing actual oil palm producers (Table 10.2). Respondents representing “large producers” and “small producers” accounted for 54.3% of our sample with the remaining representing different organizations further down the production/consumption chain (11.8%). It must be noted that several individuals represented organizations that are not directly involved in the palm oil industry but had a vested interest in the palm oil sector, e.g., “NGOs,” “academics,” “consultancies,” and “investors.” Most of the respondents were affiliated with entities that were based or were operating in Indonesia, Malaysia, Singapore, and Thailand. Several more respondents identified their field of operation in the broad region with very few respondents explicitly stating an affiliation outside Southeast Asia. This is a good indicator that our sample had some understanding of the specific environmental and socioeconomic conditions surrounding oil palm agriculture in the region. Finally, 28.3% of the respondents represented organizations that were RSPO-certified with 44% of the rest intending RSPO certification. For all questions, the most frequent scores reported were “1” and “2,” with “0” and “3” being reported less frequently (see Fig. 10.4). 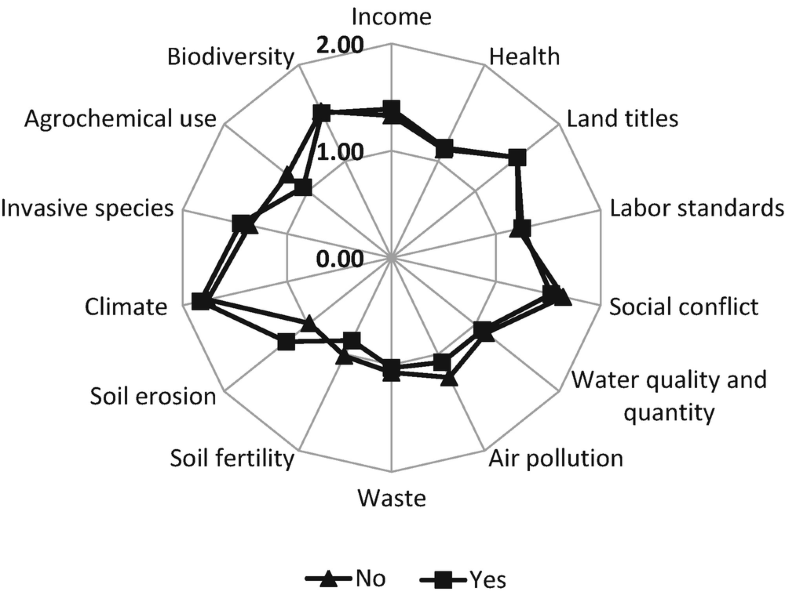 This suggests that there is a widespread perception among the respondents that the palm oil industry has indeed a negative impact on ecosystem services, biodiversity, and human well-being but that solutions exist and that progress has been (or can be) achieved. This is not surprising considering that most of the respondents were affiliated with organizations that were either RSPO-certified or were intending to become RSPO-certified in the future. As explained in the previous section, the compliance with RSPO certification standards implies the adoption of certain good management practices that have a ripple effect on ecosystems and human well-being. 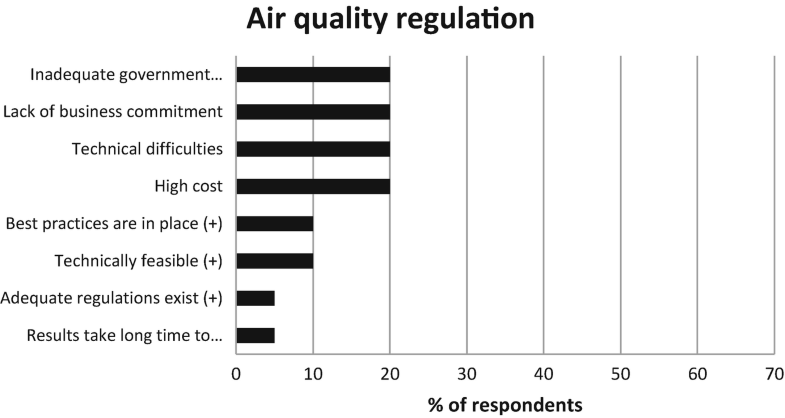 It is worth mentioning that for only four issues (i.e., “land titles,” “social conflict,” “climate regulation,” and biodiversity), the most popular score was “2.” Most importantly “climate regulation” and “biodiversity” were the only issues for which there was an almost equal response rate for scores “1,” “2,” and “3.” Such polarized views suggest the controversial nature of both topics with a lack of consensus within the RSPO community. 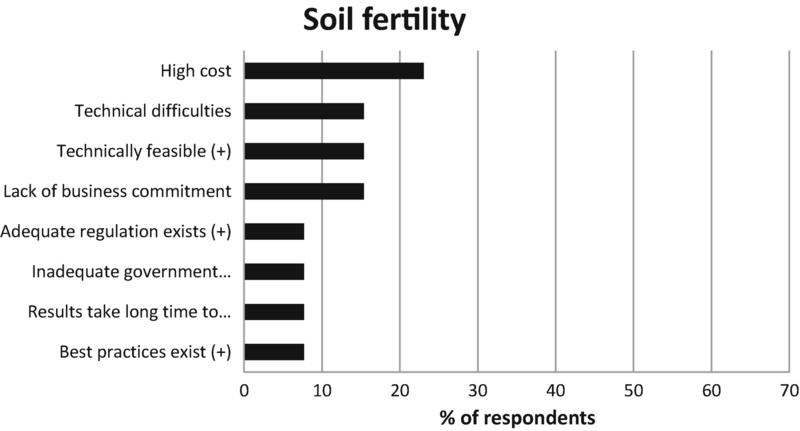 On the other hand, “0” was the second most popular response for only three impact categories: “soil fertility,” “soil erosion,” and “agrochemical use.” This trend might have been due to the realization by oil palm producers of the importance of healthy soil for the sustainability of their firms and as a result taking the necessary actions to maintain good soil quality prior to the launching of the RSPO certification scheme. Figure 10.5a, b highlights the average scores for each of the 14 impact categories by stakeholder group. The different stakeholder groups can be roughly divided into two categories: those groups that are directly involved in the palm oil production/consumption value chain (Fig. 10.5a) and those that are not directly involved but have a vested interest in the sector (Fig. 10.5b). Generally speaking the stakeholders that are directly involved in the palm oil value chain have provided lower scores (on average), which seems to imply optimism about the potential to tackle the negative impacts of palm oil production on ecosystem services, biodiversity, and human well-being. However there are two very interesting exceptions. Certifiers are not directly involved in the palm oil value chain but have reported the most optimistic responses. In particular they provided the lowest average scores in 12 of the 14 impact categories and the second lowest in 1 impact category. This optimism might stem from the certifiers’ specific role in the sector, which is essentially to assess whether palm oil producers meet the RSPO standards and as such whether they merit to be awarded an RSPO certification. As it has been discussed in Sect. 10.4.1, meeting the RSPO criteria is not necessarily difficult and should be seen as a first step toward sustainable palm oil production. It could be argued that the optimistic perception of certifiers reflects their role in the RSPO certification process which is precisely to make it accountable and thus have faith that specific interventions can indeed reduce the negative impacts of palm oil production. The second most optimistic group was the “large producers,” which reported the second lowest score in 9 of the 14 impact categories. Another interesting exception is “final consumers.”11 Even though “final consumers” are directly integrated in the palm oil value chain, they have provided the highest average scores in four of the five human well-being impacts and the second highest for the remaining impact. More interestingly their scores for ecosystem services and biodiversity impacts are much lower and more in line with the responses provided by the other stakeholder groups directly involved in the palm oil value chain. This trend might reflect the escalating social concerns among consumers (especially in countries of North America and Europe) regarding the social practices of commodities production in the global South. “NGOs” are also highly skeptical of the progress that can be achieved by the sector. They provided the highest score in seven impact categories and the second highest in three. “Academics” are also highly skeptical, albeit more moderate than “NGOs,” providing the highest average scores in three impact categories and the second highest score in seven. Among stakeholder responses that are statistically significant (at the 10th percentile), “NGOs” consistently perceive greater challenges to achieve sustainability than “large producers” do. This confirms to some extent the stereotype that “NGOs” and “large producers” represent the two extremes viewpoints in the debate about palm oil sustainability. Figure 10.6 shows that the perception of palm oil producers about the impacts of their business is the same whether they have obtained RSPO certification or not. This finding is quite interesting and implies that oil palm producers do not change their perceptions significantly during their involvement in the RSPO process or the roundtable discussions that are conceived as a way to promote the dialogue of stakeholders with different perspectives. This might imply that oil palm producers are actually seeking RSPO certification for pragmatic reasons such as the improvement of their image. Such a conclusion would be consistent with some of the findings that were obtained during the interviews with RSPO-certified producers (refer to Sects. 10.4.1 and 10.5). In a similar manner the perceptions of “large producers” and “small producers” based in Indonesia and Malaysia are relatively similar (Fig. 10.7). This is somewhat surprising, given the reputation that the Malaysian palm oil sector is subject to stricter regulation. The main difference lies on the perceptions about land titles. Respondents from Indonesia provide a higher average score, which reflects a concern that is particularly pertinent in the country. Sometimes the customary rights to land use are different than the legal rights, and this has led to conflicts between producers and local communities (Sect. 10.2.4.5). Finally the perception of respondents with an interest in biodiesel production exhibits a very similar pattern when compared to the perceptions of respondents that are not interested (Fig. 10.8). This might be due to the fact that the final use of palm oil is determined further up in the supply chain. Besides, oil palm for biodiesel was still at the time of the survey a relatively incipient business; thus strong opinions might not have been formed yet with respect to this issue. Response rates were much lower for the qualitative part of the questionnaire and varied significantly among the different impact categories. As expected the obtained results were quite different for each impact (Figs. 10.9, 10.10, 10.11, 10.12, 10.13, 10.14, 10.15, 10.16, 10.17, 10.18, 10.19, 10.20, 10.21, and 10.22), but some common trends can be identified. Surprisingly, with the exception of “health,” cost has not been identified as a major barrier for improving the impacts of palm oil on human well-being (Figs. 10.18, 10.19, 10.20, 10.21, and 10.22). 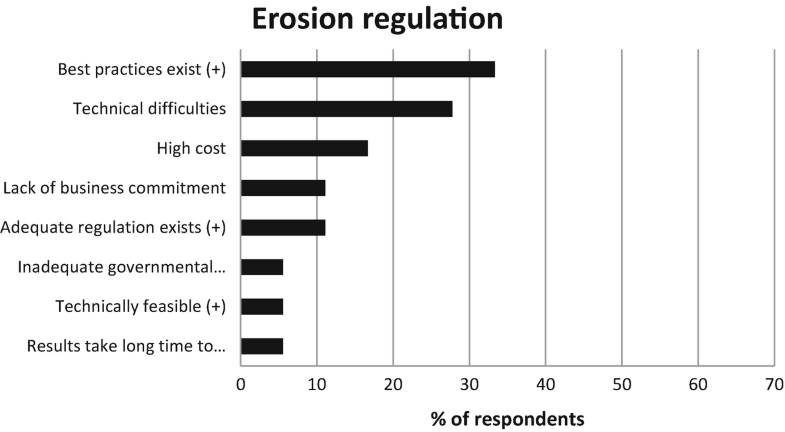 On the other hand, cost and technical constraints were identified as the key barriers for reducing the stress on ecosystem services and biodiversity (Figs. 10.9, 10.10, 10.11, 10.12, 10.13, 10.14, 10.15, 10.16, and 10.17). That is to be expected given that most of these impacts can be ameliorated with the adoption of good management practices (refer to Sect. 10.2.2) which are usually more costly than the current practices of the palm oil industry. Another interesting finding is that for each impact category, government or government-related issues (e.g., regulations, implementation/enforcement of regulations) were identified as a major contributor to the current situation and a key barrier for future improvement (Figs. 10.9, 10.10, 10.11, 10.12, 10.13, 10.14, 10.15, 10.16, 10.17, 10.18, 10.19, 10.20, 10.21, and 10.22). At the same time none of our respondents was affiliated with a governmental body. In fact very few RSPO-RT8 participants represent government institutions, suggesting the lack of proper governmental engagement in the RSPO-RT8 process. In 2010, approximately 4.5% of the global palm oil production capacity was RSPO-certified, while in 2012 approximately this stood at 11% (RSPO 2012). Within the following 5 years, final consumers from Europe had pledged to purchase at least 40% of their palm oil from RSPO-certified companies. One of the driving forces behind this increasing interest in RSPO-certified palm oil is the current debate on biofuel-induced deforestation in Southeast Asia and its accompanying impacts (i.e., biodiversity loss, GHG emissions). The CEO of a large palm oil production company referred to this social pressure by implying that “environmentalists are so obsessed with palm oil production that they forgot the illegal timber industry, which still is the main driver of deforestation”. The adoption of the RSPO standards can produce a series of environmental and social benefits both locally and globally. Compliance with the RSPO standard implies the adoption of certain socially and ecologically responsible practices. Some of these practices can promote environmental quality and subsequently enhance the provision of certain ecosystem services. Additionally RSPO-certified firms are required to monitor and document regularly their performance. Such activities usually entail higher production costs. In fact, managing a RSPO-certified plantation can cost RMM 20/ha/yearr. (USD 6.3/ha/year) more than a conventional farm. Despite this interest the market does not recognize RSPO-certified palm oil with a good premium (just USD 5–8/ton, with CPO prices hovering around USD 800/ton). At the time of the survey, palm oil biodiesel production was a new business option, and shifting to it was not always a feasible investment strategy. For example, a large palm oil producer in Bohor (Malaysia), with decades of experience in the industry, had laid careful plans to commence biodiesel production. However when the production was about to start, the company encountered problems that mainly stemmed from European concerns over potential “food vs. fuel” conflicts, as well as the decreasing petroleum prices and the increasing CPO prices (July 2010). In a way they were “forced” to halt their biodiesel investment plans fearing that their venture into biofuels might hurt their well-establish business in the food sector. Even though they were considering selling the biofuel conversion plant, they were also considering obtaining RSPO certification for some of their plantations in order to guarantee the good image of the company. In fact the adoption of RSPO certification is seen by several companies as a means of improving their image and as a prerequisite to secure a competitive advantage in the EU, the USA, and Japanese markets, whether for food or biodiesel production. With these things in mind, the main question that remains is: will RSPO certification, in its current format, be enough to guarantee palm oil sustainability in the long run? In our view there are three main reasons why this will become more difficult in the future. First of all, a large portion of the Malaysian/Indonesian palm oil exports goes (and will go) to China and India, two countries that have a lax approach toward environmental standards. Secondly, as biodiversity loss and climate change have become the most dominant environmental concerns in the palm oil sustainability discourse, the RSPO will be under increasing pressure to design more effective strategies to tackle these issues. 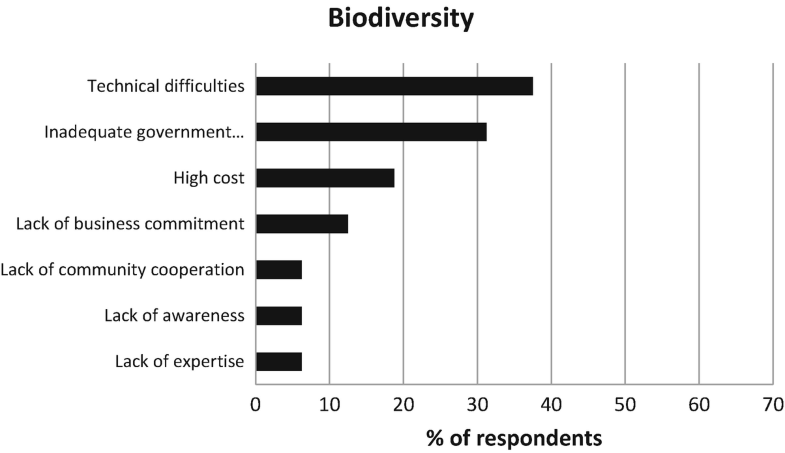 However as the results of our survey have shown, biodiversity loss and climate change are the two impacts with the most polarized perceptions regarding the extent to which the sector can tackle them in a cost-effective manner. If the RSPO adopts standards that are not cost-effective, then palm oil producers might avoid obtaining RSPO certification. Thirdly, and maybe most importantly, as a management system, the RSPO can guarantee minimum social and environmental standards of palm oil production but cannot put a cap on palm oil production capacity. All current scenarios suggest that the demand for palm oil will grow in the future and there is little doubt that this added demand will be an agent of deforestation in the region. On the other hand, it should be kept in mind that oil palm agriculture is a highly efficient form of vegetable oil production. Palm oil yields can range from 4–5 ton/ha to 9 ton/ha when using good management practices in favorable growing conditions. Other oil crops have much lower yields (FAO 2017) which means that their expansion will most likely be a major factor of LUCC elsewhere, possibly degrading ecosystem services and biodiversity. As already discussed the RSPO certification scheme is an important governance mechanism that through the improvement of local ecological and social conditions can have ripple positive effects on local ecosystem services and human well-being. However, a long-term perspective on the sustainability of the sector needs a regional or global governance mechanism to address all the possible trade-offs particularly when considering the increasing demand for palm oil biodiesel and the emergence of climate change and biodiversity loss as overarching policy agendas. Starting from a reference year, create a cap on oil palm plantations on forested land but allowing the establishment of plantations in areas that were formerly under other uses (e.g., agriculture, pasture, degraded land). Improve the efficiency of palm oil production, perhaps by developing new high-yield oil palm varieties. Promote and improve the efficiency of small-scale biofuel projects (e.g., FAO 2009). Promote agroforestry and small-scale palm oil production. Create a “certificate of origin” for the biodiesel originating from plantations located in administrative regions (municipalities) with controlled deforestation. For example, a farm would get the certificate only if the municipality where it is located has a small or zero rate of deforestation. This would put peer pressure over the producers in the municipality. Finally, it should be mentioned that using stakeholders’ perceptions as a means of understanding the impacts of oil palm expansion on ecosystem services, human well-being, and biodiversity implies the reliance on subjective and thus unverifiable data to infer the actual impacts and their magnitude. On the other hand, it allows for a relatively quick identification and evaluation of potential impacts which would have been too time/resource consuming to perform otherwise. Therefore, the results of our study should not be viewed as an attempt to replace empirical ecosystem impact assessment. Our results simply aim to understand stakeholders’ values and priorities in order to (a) identify and (b) quickly assess the main impacts of oil palm expansion on ecosystem services, human well-being, and biodiversity. Such information can complement empirical evidence and can be used to inform the development of appropriate policy mechanisms that will target palm oil sustainability. Our study has reviewed the evidence of how the production and use of palm oil biofuels affects biodiversity and several provisioning (e.g., fuel, food, freshwater), regulating (e.g., climate regulation, air quality regulation, erosion control), and cultural ecosystem services in Malaysia and Indonesia. It also discussed how this change in ecosystem services provision can affect the human well-being of the local communities. The surge in biofuels in the late 2000s put some pressure on the palm oil industry to improve the sustainability performance of its product. For example, the European Union through its 2009/28/EC Directive has adopted legally binding provisions about the acceptable limits of GHG emissions and deforestation for palm oil that is used for energy purposes within Europe. Such provisions have largely catalyzed a growing demand for the adoption of certification standards that was a promising sign about the sector’s impact on ecosystem services. On several occasions voluntary market-driven mechanisms such as the RSPO certification scheme have successfully promoted good environmental and social practices. The demand to conserve riparian forests, prohibit the cultivation of oil palms on steep terrains, and phase out toxic agrochemicals are only some of the good practices “required” by the RSPO standards. These practices can have a ripple positive effect on ecosystem services and biodiversity conservation. At the same time, certification schemes face great challenges. Using the RSPO as an example, this chapter has highlighted that this scheme might not be sufficient to tackle palm oil’s intertwined impacts on climate change, ecosystem services, and biodiversity. There is the need to have a dynamic approach to certification schemes, adjusting them to account for the aggregate stress of the growing oil palm sector. A balance has to be struck between acceptable environmental targets and cost-effectiveness in order to ensure the acceptability of certification standards by producers. However, far from being homogeneous, the perceptions about the sector’s impacts on ecosystem services, biodiversity, and human well-being, (and the potential to mitigate them), were very divergent in the early 2010s among the different actors that comprise this multi-stakeholder alliance. Furthermore, stakeholders’ perception regarding the industry’s impacts on climate and biodiversity was very polarized. Reconciling these different perceptions should be a first step for coming up with mutually acceptable standards. This would be a great bet for certification schemes such as the RSPO in the future. This will most likely involve a closer cooperation between the different RSPO working groups and indeed between the diverse stakeholders themselves. It will also demand a closer cooperation between the RSPO and government institutions in Malaysia and Indonesia. In 2013, palm oil was the seventh most widely traded agricultural commodity in monetary terms at USD 33.8 billion with the biggest importers being India, China, the Netherlands, Pakistan, and Nigeria (FAO 2017). There were also certain examples of oil palm expansion through the direct influence of the Indonesian government. For example the government of Aceh Barat Daya ruled that community members could establish oil palm plots (up to 2 ha per household) with the government providing necessary inputs such as fertilizer. This regulation led to massive land conversion by smallholder farmers (Tata et al. 2010), but the ensuing global financial crisis resulted in many Indonesian producers reducing or halting their planting program (NBPOL 2009). It is expected that in 2050, 42% of the global vegetable oil production will be diverted to industrial uses, when compared to 16% in 1976 and 24% in 2006 (FAO 2006). Each of these issues affects indirectly all of the constituents of human well-being in the MA conceptual framework. POME has BOD of 21,500–24,500 mg/L which is several times higher than that of sewage water. This is an indicative ranking that can depend on the characteristics of the soil itself and the cultivation method adopted among other factors. On several occasions the findings regarding palm oil biodiesel impacts are contradictory, for instance, the case of biofuel-related GHG emissions (refer Section 10.2.2.2). According to the official registration list, 650 people registered for the event. RSPO-certified companies are now providing training and safety equipment to their employees. For example, companies plant flowers in order to attract insects (e.g., bees) that hatch their eggs in the larvae of the worm that destroys the oil palm leaves or use owls to hunt rodents that climb on palm trees to eat the palm kernels. This category includes companies that use palm oil as a raw material and are active in diverse industries such as food processing, pharmaceuticals, and cosmetics. “Final consumer” concerns over palm oil sustainability have been identified as a major driving force behind the development and increasing adoption of the RSPO certification scheme. This research was part of the project “Biofuel Use Strategies for Sustainable Development” supported by the Global Environment Research Fund (E-0802) of the Ministry of the Environment, Japan. We also thank the United Nations University Institute of Advanced Studies (UNU-IAS) for the support for the research.